Drafted 29th overall by the Vancouver Canucks in 1991, Jassen Cullimore has dedicated his life to the pursuit of the “Canadian Dream”. He learned to skate at the age of 3 ½ under the watchful eye of fellow inductee Fred Bridgewater. Jassen later honed his skills with the Port Dover Minor Hockey Association before moving on to junior hockey in Caledonia at age 13, the Simcoe Rams at 14, and playing the next year with the Peterborough Petes of the Ontario Hockey League (OHL). To cap off his junior career, Jassen was selected to the OHL’s Second All-Star Team and was a member of the Canadian Junior Hockey Team which travelled to Fussen, Germany to compete in the World Junior Hockey Championships. Stints with the Hamilton Canucks and the Syracuse Crunch of the AHL led to Jassen’s NHL debut in 1994 with the Vancouver Canucks. There were a couple of seasons with the Montreal Canadiens and a couple more in places like Fredericton (AHL) and Providence (AHL) before moving on to the Tampa Bay Lightning (NHL) the pinnacle of which was his 2004 season in Tampa Bay when he won the Stanley Cup. As is so typical of Jassen, in a low-key but impressive display of his humble nature, he brought the Stanley Cup to Port Dover so the whole community could enjoy his success. After a stint with Tampa, Jassen joined the Florida Panthers where he finished the season with a +21, second in the NHL. 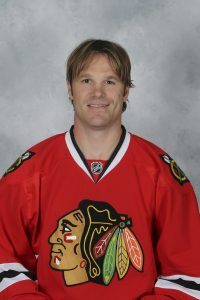 He also had stints with the Chicago Blackhawks as well as the Rochester Americans (AHL) and the Rockford IceHogs (AHL). He travelled with the Hawks during part of their 2010 march to the Stanley Cup and as of his induction, had just recently signed with the Hawks. The 6’5”, 220 pound defenceman who was often used to shut down the opposition’s top line continued to make Norfolk County proud, not only as an NHL player, but for his tireless work with local charities and as a mentor to young athletes throughout the area. In Tampa he sponsored “Culleys Crew” which gave tickets to Tampa games to families with children with cancer and in Chicago he joined “Teammates for Kids” which donated to children with special needs. Locally Jassen was a supporter of Port Dover Minor Hockey, the Norfolk Pros, the Fresh Air Fund and the Run for the Cure to name a few. As Don Dobie wrote, “Jassen has had a remarkable career and promoted his community yet humbly recognized his good fortune”.